The park enhancements will be focused on the park trail, restroom, and picnic areas in the southwest corner of the district park. 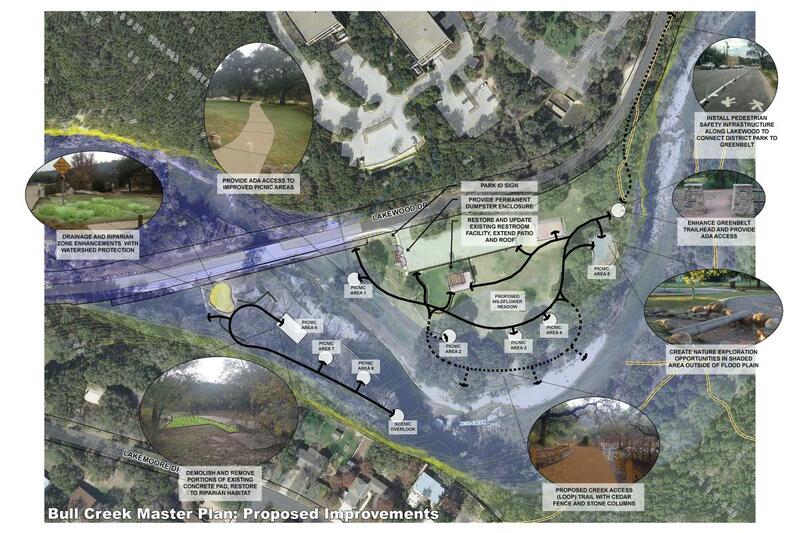 The intent is to preserve the park’s natural beauty and characteristics while providing long term solutions to connectivity, wayfinding, creek access and waste management. The majority of the proposed amenities and site improvements are focused near the existing parking lot and restroom which anchor the district park. An ADA walking path will connect several picnic tables and provide access to other park amenities. Wayfinding and access points will be provided to Bull Creek. In addition to the site improvements, the restroom building will be improved to provide ADA access and better opportunities for community gathering. The park masterplan was completed in 2016 after holding three public input meetings. The Masterplan is being used as a guide to complete design development and permitting. Construction is expected to begin in the fall of 2019.